SELL HIGH. SELL FAST. SELL SMART. 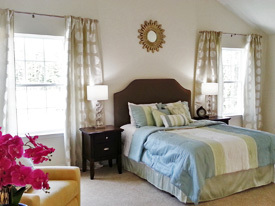 Staging a home isn’t just pretty decorating. You need someone who can create a mood that will trigger appropriate emotional responses from potential buyers. Successful staging requires a very strategic approach to merchandising your property, drawing the buyer’s eyes to assets and minimizing negatives, while carefully squeezing maximum impact at lowest cost to be more appealing than properties competing for your target buyer. Victoria Guillot, “The Stage Coach”, has the skills, creativity and experience to maximize your profits and deliver results in all price ranges, from starter homes to luxury estates. Victoria’s services are available for occupied and vacant homes. Victoria is an award-winning professional home stager and redesigner of 10 years, with over 30 years in the real estate industry. She is trained and certified to see a home’s potential and enhance its assets to appeal to the broadest number of potential buyers. She has been mentored by two of the staging industry’s superstars: internationally recognized Debra Gould, The Staging Diva, and Alice T. Chan of HGTV’s Power Broker. Since 2006, she has helped countless sellers, including many with homes on the market unstaged for a year without any offers, then staged by Victoria and sold in 24- 72 hours. 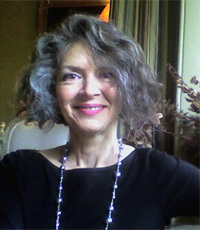 She also teaches Advanced Staging to real estate agents and is author of The Stage Coach Book of Staging Tips for Home Sellers, with sales in the US, England and Germany. This home had languished on the market with little foot traffic, feeling tired, sad and forgotten. At $1.4 million, it needed more appeal. 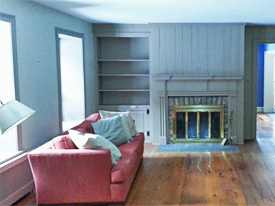 The existing sofa was moved to another room. 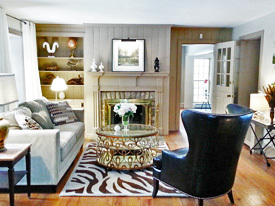 After staging, you felt the luxury and warmth this fabulous estate offered. Historic charm was emphasized yet a current, comfortable lifestyle was showcased. Foot traffic skyrocketed, leading to sale. This model wasn't getting enough foot traffic, so the developer asked Victoria to stage on a small budget. Now prospective buyers prescreening listings online see something more exciting to catch their attention and make their shortlist. 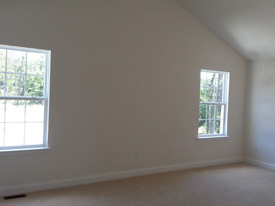 You can better appreciate the scale of this master bedroom after staging. Windows appear taller and grander. The space feels elegant, soothing, and inviting. 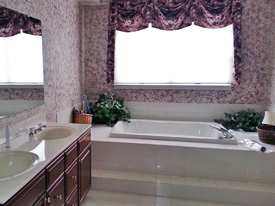 Before, this master bath dated the house and dragged down its price. 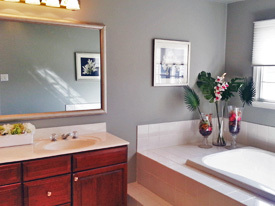 After paint, carefully selected upgrades and accessories, it showed as a tranquil, spa-like retreat for today's tastes. If your Pennsylvania or New Jersey house needs to be staged in the Bucks County, Doylestown, New Hope, Warrington, Newtown, Montgomery County, Hunterdon County, Lambertville, Stockton and Princeton areas contact Victoria Guillot today.